Support your local makers this holiday season! 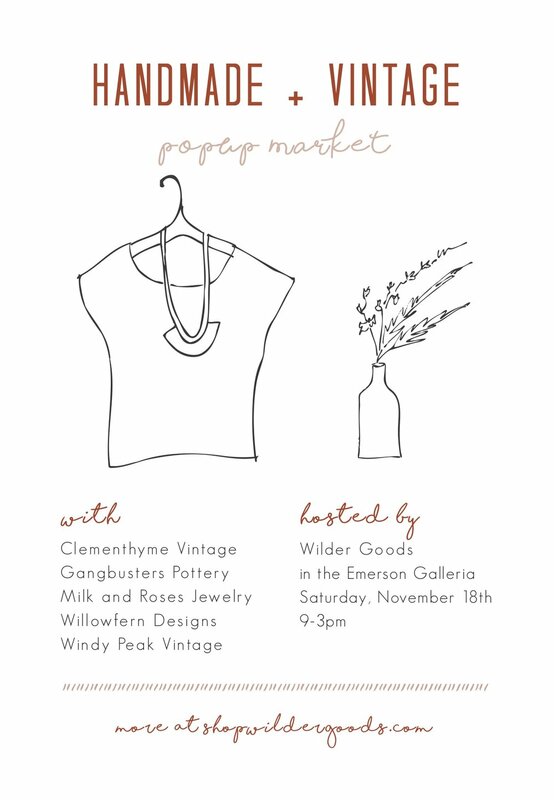 Join us Saturday, November 18th for a popup market at Wilder Goods. Clememthyme Vintage is Jasmine Lilly, one of the creators of the Bozeman Flea. Her one-of-a-kind style and thrill of the hunt, always produce a collection that's thoughtfully curated and full of surprises. Gangbusters Pottery is Ryan Mitchell, a local and loved potter. He has developed a unique style of his own, creating highly functional porcelain pieces for everyday use. Milk and Roses Jewelry is a line of jewelry handcrafted by Natalie Brown, an inspired metalsmith and writer. Her one-of- a-kind, everyday adornments embody a marriage of romance and rust: they have a timeless charm and an organic, wabi-sabi sensibility in which gemstones are raw, metal is distressed, and each quietly expressive piece is imbued with soul. Willowfern Designs is Fern Louise Ritchie, usually spending her summers on a farm and her winters cozied up in a cabin endlessly knitting and drinking tea. Her work is a reflection of life's little joys with just a touch of whimsy, mystery, or maybe even some magic. Windy Peak Vintage is Kristi Reed, sharing unique vintage clothing & handcrafted goods, thoughtfully curated and ethically gathered. Drinks and snacks and good people all around. We are currently buying vintage clothing for fall and winter. We are looking for 60's - 80's era clothing — natural fabrics; denim (wrangler's and levi's), wool sweaters, cotton and linen tops and dresses. Excellent condition only please. Our buying hours are Tuesdays 11-1pm. Art Reception at Wilder Goods, open to the public, 5-7:30pm. A collaborative art show featuring artists with a passionate vision of our relationship to wildlife, as well as presentations from wildlife experts on advocating effectively with our representatives, bridging opposing viewpoints, and nurturing our spiritual connection and responsibility to wildlife. Harvest Farm to Table Dinner at the Emerson Grill, ticketed event $100/person, 7:30-9:30pm. A full­-course harvest dinner with wine pairings, featuring food from local farms committed to sustainability and coexistence. During dinner, wildlife experts will lead roundtable discussions with guests on creative, positive, and effective ways to engage with wildlife issues. Vegetarian/vegan options available. We expect reservations to fill up fast, so reserve your spot today! We invite you to join us for a gathering of friendly folks, inspired shopping and refreshments. If you love the offerings at Wilder Goods, you will also love our 'sister shop' Windy Peak Vintage. Windy Peak is an online shop with a retail location in Livingston, Montana, specializing in unique vintage clothing & handcrafted goods, thoughtfully curated and ethically gathered. Come share in our joy of finding and sharing beautiful things! Tarot Readings with Charissa Crayton every Tuesday from 1-3pm in the Wilder Goods Art Gallery. Charissa has been exploring tarot for herself and close friends for 11 years, as a means of self reflection and spiritual direction. The more she shared with people the more she realized that there are a great many of us who struggle to know ourselves and seek answers outside of ourselves. Charissa's intention is to help you understand your goals and desires, frustrations and suffering, and put them in a present context allowing you to understand your situation from a new perspective and find the best ways forward. Her readings are not intended to be fortune telling, rather a conversation, filled with honesty, insights and revelations. The future is up to you and when you understand your position clearly and from a place of balance you can affect real change. Charissa balances her Tarot practice with a morning meditation, a curiosity and exploration of dream life, meaningful conversations with friends and lots of coffee. Join pastry artist Jasmine Lilly of Whipped, for a unique painting workshop where you'll discover the tricks and techniques to create one-of-a-kind watercolor style painted cookies inspired by the majesty of Montana summers. $50 admission - includes 4 cookies to paint, recipe booklet, delicious bites and refreshments. We're so excited to have our 'sister shops' Windy Peak Vintage, Shiny Penny Vintage and Milk and Roses, join us for a pop-up market. Windy Peak is an online shop with a retail location in Livingston, Montana, specializing in unique vintage clothing & handcrafted goods, thoughtfully curated and ethically gathered. Shiny Penny Vintage is Jasmine Lilly, one of the creators of the Bozeman Flea. Her one-of-a-kind style and thrill of the hunt, always produce a collection that's thoughtfully curated and full of surprises. Milk and Roses will be sharing her small intimate jewelry without too much flash or fuss, with plenty of magic and meaning. Drinks and snacks and good people all around. Indigo and Shibori Workshop with fiber artist Alayna Rasile-Digrindakis. Alayna is a a textile artist and designer who works with natural fibers and plant dyes in her art practice as well as her collection of one of a kind clothing. She is building an off-the-grid studio outside of Helena, MT that will be the future home of Hi-Altitude Center for Textiles. Trained through a residency at the Textile Art Center in Brooklyn, NY, Alayna has a breadth of knowledge in weaving, quilting, screenprinting, and dyeing. In this 3.5 hour workshop we will learn two methods to make an organic, chemical-free, indigo dye vat. While the vat develops, we will explore different folding (Kumo), binding (Itajime), and wrapping (Arashi) methods of creating a resist on fabric - and then we will dye everything blue! Sign up now to reserve your spot! Space is limited. Join us for an evening of art and celebration. We will be featuring local artists' work in clay and fiber as well as celebrating our one year anniversary! Refreshments provided. The Defenders of Wildlife present 'A Season of Predators' Defenders of Wildlife, along with the Blackfoot Challenge, is excited to host a special screening of A Season of Predators by AlpenglowPress Productions. This powerful documentary explores the history of human-predator conflict in the Northern Rockies and looks at creative approaches that landowners and conservation groups can take to promote conflict avoidance. Following the film, there will be a panel discussion and Q&A featuring local ranchers and experts from Defenders of Wildlife, Montana Fish, Wildlife and Parks, the U.S. Fish and Wildlife Service and Blackfoot Challenge. Please note, doors open at 6:30 pm and the event will begin at 7:00 pm. Seating is limited and event entry will be on a first-come, first-served basis. However, we appreciate your RSVP so we know we can count on you to be there! Following the panel discussion, please join us at Wilder Goods for drinks, food and further discussion. A contemporary art show and gathering to express our love and concern for wildlife. Local artists will share interpretations of their connection to the wild. A portion of the proceeds will go towards wildlife protection. Advocacy groups will be present to share their work. Refreshments provided. If you are an artist interesting in showing your wildlife focused work, please email us info@shopwildergoods.com. Last Art Walk of the Season! We are currently showing work from Cherlyn Wilcox, Megan Purcell, Abbey Freed, Christine Sutton and Steve Apple.